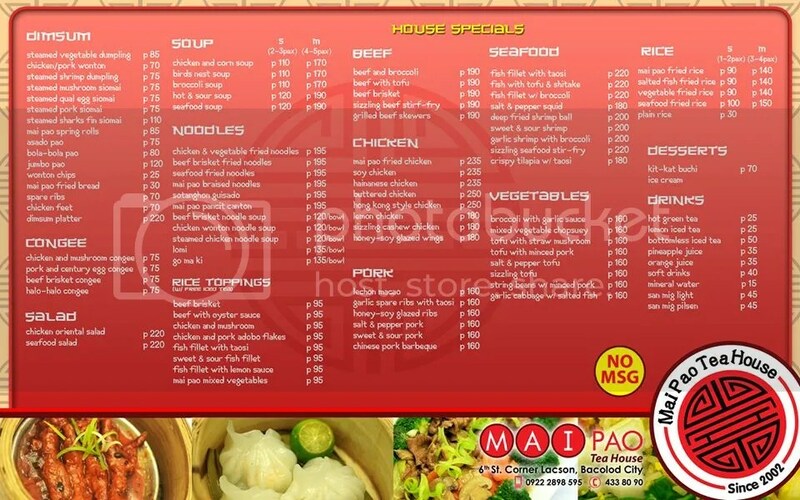 Mai Pao’s back on the culinary radar with a new revamped menu and affordable chinese dishes for everyone! This restaurant has undergone a major revamp from the decorations to more importantly: THE FOOD! Mai Pao is still on it’s old location along 6th street across from Mc Donalds. Bacolod’s famous Chef JP Anglo helped redesign the menu and now it is both affordable and delicious! The interior of Mai Pao is gorgeous, with classic chinese advertisements framed and lovingly hung on the walls. This place is beautiful and perfect for barkadas/group lunches. It’s quite cozy! A Cozy nook in Mai pao. Comfy comfy comfy. I admit, I wasn’t expecting much when I ordered their dim sum. When the waiter opened the bamboo steamer, I immediately perked up. Is it possible? The dimsum was PERFECTLY steamed and firm. The wrapper wasn’t soggy. I ignored the dipping sauce, popped the tempting morsel in my mouth and was immediately transported to dim sum heaven. I’m not exaggerating! The wrapper was firm, the meat soft and perfectly steamed and a nice firm crunch as you bite into the shrimp and as you do, a rich taste of seafood floods your mouth. You can taste the sweetness of the shrimp.. This truly IS the BEST SIOMAI in Bacolod! Oh my Gosh. This dish just blows all other places’ dimsum away. My good friend Jp Anglo, you have outdone yourself. Ha Gow shrimp dimsum (75 php). Note the soft sensual folds hiding hints of pink shrimp. The mushroom siomai has a very down to earth taste. with the rich flavor of mushrooms and a tantalizing aroma. One really good siomai was the steamed vegetables and mushrooms siomai. The dimsum itself was light and clean tasting. A very mellow and healthy kind of siomai to round out the seafood taste. Wow, what a rush. Typing this is harder than it looks. I love dim sum! Or course, we can’t just leave this post with dimsum. We also tried their new and revamped dishes. First up, we started with their Hot and Sour soup. A classic Chinese staple, This came in just the right degree of sourness and it came with generous amounts of meat and mushrooms. It’s so thick and rich, it’s practically a meal in itself. Hot and Sour.. (120 php) Yummy! One of the main dishes that we ordered was their excellent beef brisket and fried noodles. Marinated thick slices of soft, melt in your mouth beef brisket among a bed of crispy fried noodles and vegetables… Awesome! We ordered their special sea food fried rice. It had bits of squid in it along with egg, carrots and green peas. This was practically also a meal in itself. It only served to whet our appetites for the rest of the food to follow! Seafood rice. (150 PHP) It just hits the spot. Sweet and sour shrimp, you have to try this the next time you guys visit Mai Pao. It’s shrimps, covered with a light batter and served with a slightly sweet and spicy sauce. Oh so good. Better make sure you have fingers left cause Mai Pao also has their own version of Hainanese Chicken. Steamed chicken in a flavorful sauce served with ginger. This is a very simple yet filling dish. It’s one of our favorites. Before I used to go to Imay’s or even L’sea to try their Salt and Pepper Squid, unfortunately their quality has gone way way down. Mai Pao’s version is fantastic, with the right blend of salt and hot chilies. Nom Nom Nom. This is cooked just right. It’s CRUNCHY and not soggy and limp like the other restaurants. Man, this version blows all the others out of the water. We tried one of Mai Pao’s best sellers the honey-soy glazed spareribs. It is excellent! This dish was one of the most popular and rapidly consumed at our table. Rich honey glazed ribs in a tangy sweet sauce but it is pleasantly offset by the well-seasoned meat. A must try. really. Try this one too! And of course lastly we had tofu with minced pork. GREAT!!! This is great. I know I’m coming back for the dim sum and once Mai Pao rolls out their plan for chinese food delivery, I plan to order from them a lot. Thanks for reading this very long article. 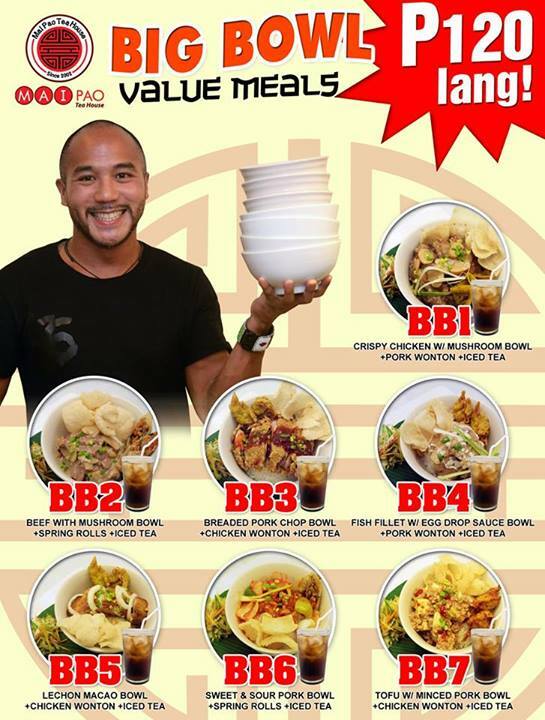 Please do try out the dimsum and Mai Pao’s specials they are so good! 🙂 Until next time guys! Click on this to see the menu and contact numbers! Next Post Sofia: Awesome Traditional Filipino breads.